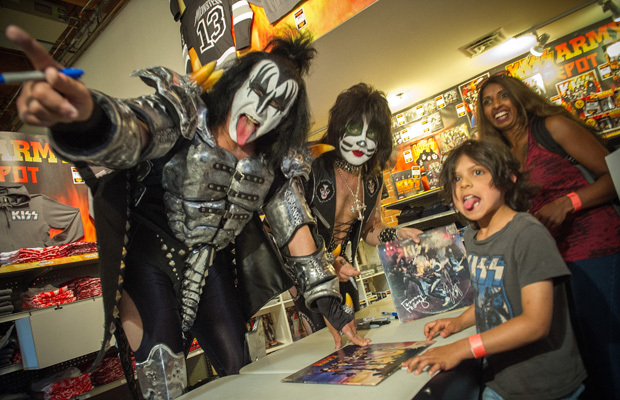 After 40 years and enough greasepaint to fill an Olympic-sized swimming pool, founding KISS members Gene Simmons and Paul Stanley still understand one very important thing: the fan. The ancient rockers in the tight spandex (oh yes it is), eight-inch high boots and studs for days were in Vancouver Thursday with the other members of the the band Eric Singer (drums) Tommy Thayer (lead guitar) to launch their Monster Canadian Tour, promote a pop-up store and toss some cash towards Simmons’ daughter Sophie’s namesake charity Sophie’s Place (a Surrey facility for kids who have suffered emotional and physical abuse). Onstage at Tom Lee looking like a stand of silver and black trees the garish (you can see Simmons’ fleshy upper thighs through the cutouts in his tights for God’s sake) gang sang the praises of their devoted KISS Army of which about 200 plus were outside waiting to meet and greet their rock Gods once they had finished talking to the press and passing a cheque for $10,000 along to Surrey Mayor Dianne Watts and Sophie Tweed-Simmons for Sophie’s Place. Simmons a.k.a. The Demon told the assembled media and others that as a band KISS has always known that they were simply employed by their audiences and everything they do is informed by those audiences. Simmons, who loves nothing better than marketing, says the inspiration for the massive merchandise catalogue (think the KISS casket, KISS onesies PJs, KISS skis, KISS barbecue covers and of course KISS T-shirts) comes from the fans. He said the fans let them know what they want and those things are on the shelves of the KISS Army Depot pop-up store that is located on the main floor of Tom Lee and will be popping up in Calgary, Edmonton and Toronto as the Monster Tour makes its way across the country. The tour opens in Victoria on Friday and the boys will be back in Vancouver for a show on Saturday. During the press conference questions were volleyed at the band, who let Stanley (who weirdly reminded me of a fitter and more cogent Liza Minnelli) do most of the talking. Simmons was too busy mugging for the cameras and making sure everyone in the room remembered his tongue is one of his best assets. I asked what is the biggest difference between KISS of 40 years ago and the guys standing in front of us now. Well aside from a 100 million in international record sales Stanley pointed out the obvious. “Well, we’re older,” said Stanley, before launching into a laundry list of things the band has learned over the years. He also admitted that the band today likes each other a lot more than they used to. The band closed their Vancouver promo stop off with a meet and greet with a lucky 200 fans who were ushered into the pop up store for autographs. The gathered were all ages and all stripes of fans. A seven year old boy told me he loves the band and his favourite part is when Simmons sticks out his tongue and spews blood.